Whether you are a beginner green behind the ears or a seasoned veteran, let’s perfect our craft together. If you enjoy kombucha and are curious about how it’s made, you have landed in the right place. In addition to being a refreshing and delicious drink, kombucha has a wide range of health benefits. Called the Immortal Health Elixir for thousands of years, kombucha has been gaining in popularity for good reason. Join us to see how to make kombucha in a 4 litre batch with the following guide. 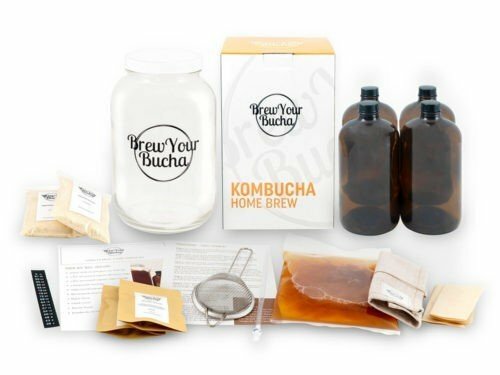 In this demonstration we are using our Brew Your Bucha 4 Litre kombucha Starter Kit. However, you can use your own equipment and follow along too. If you are brewing in a different sized vessel, be sure to adjust the recipe proportionally. Once you have completed brewing raw kombucha and are ready to move on to bottling and flavouring, continue to our bottling video or to our recipes page. Step 1: In a large pot or water boiler, boil 2 litres or about 0.50 gallons of filtered water and remove from heat. Place water in the 4 litre brewing jar. Step 2: Add 1 pack of pre-measured Organic Tea (16g) into the disposabe tea bag and place into jar. You can secure the tea bag with a toothpick or fold it over so tea does not fall out. Steep tea for 8-10 minutes and discard when done. Step 3: Add 1 pack of pre-measured bage of organic sugar (250g) into the jar and stir until dissolved. You now have sweet tea! Step 4: Fill your brew jar with just under 2 litres or .25 gallons cold, filtered water, leaving approximately 3 inches of space from the neck of the jar. Step 5: Let your brew cool to approximately 23 degrees Celsius or 74 degrees Fahrenheit by checking the temperature strip on the side of the brew jar. You don’t want to burn your mother SCOBY, she’s quite sensitive! Step 6: Open your SCOBY pack and empty the entire contents into the brew jar. This will include the starter fluid (raw kombucha). Your SCOBY is healthy if it floats or sinks. Step 7: Gently stir the mixture with a wooden spoon. Step 8: Use the cotton cloth to cover the mouth of the Brew Jar and secure it with the rubber band. This is to ensure that dust particles and insects do not contaminate the brew. Step 9: Place your jar of kombucha in a warm dry place (room temperature) that is out of direct sunlight and also has lots of airflow. Do not move it for 6 days. The brewing process varies based on the temperature of your room. The warmer it is, the faster your SCOBY will work on brewing kombucha; while the colder it is, the slower it will be. Step 10: After 6 days, taste your brew to see if it is ready. Using the included pipet straw, extract some kombucha from the inside wall of the jar and taste. The ideal taste is tangy with a hint of sweetness still remaining. If it is too sweet for you, leave it for a few days and re-taste. If it is too sour, it is time to move to the next step. You can add flavours and sweetness to satisfy your palate in the bottling process. Step 11: Once you are satisfied with the flavour, you are ready to bottle your brew! 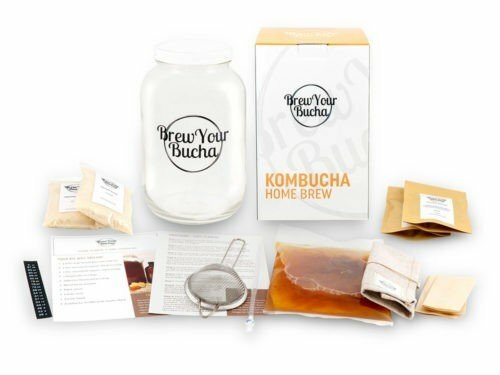 After thoroughly cleaning your hands, remove your SCOBY and place into a glass container with 1 cup of raw kombucha (to be used for your next brew). Cover the container with your cotton cloth and secure with a rubber band. Derek from Brew Your Bucha is here to present our full length detailed instructional video on how to make Raw Kombucha, also known as the First Fermentation. 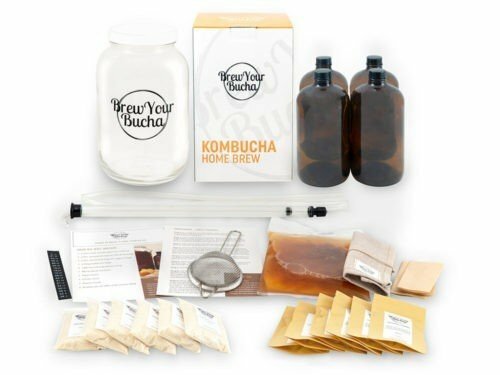 We use our Brew Your Bucha 4 Litre Kombucha Starter Kit for this demonstration. However, the same techniques can be applied to smaller or larger batches with similar equipment if you are to source the items yourself. Visit our Shop if you prefer to start out using our brewing kits, accessories and tea. So you have made raw kombucha. What do you do next? bottle it of course! This is where your creativity can shine and you can add your favourite fruits, vegetables, herbs and spices. We call this step the Second Fermentation. However, in this video we show you how to bottle the kombucha raw for a delicious drink in it’s most basic form. For our newest recipes, continue to our recipes page. However, the same techniques can be applied to smaller or larger batches with similar equipment if you are to source the items yourself. It’s up to you! Visit our Shop if you prefer to start out using our brewing kits, accessories and tea. So you have made raw kombucha. What do you do next? bottle it of course! This is where your creativity can shine and you can add your favorite fruits, vegetables, herbs and spices. We call this step the Second Fermentation.